If Star did not have a couple of things going in her favor (like a foster family that is besotted with her and shelter staff who have worked hard to help her have a good outcome) you can imagine that it might be tough for her to find a good home. She's a black dog, a pittie mix, and has a big scar. She has an abundance of energy and not the best impulse control. She pulls on the leash like a madwoman and in the shelter, she could get growly and nippy...in a frustrated way, not in an aggressive way, but still not what adopters like to see. But the more I spend time with dogs like this the more I wish every dog--even the "unadoptable" ones--could spend even a few days or a week in a foster home. And the more I wish that every person who is scared of pit bulls or believes the hype about them could just spend a few hours with one. 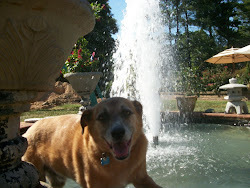 Star has proven to be one of the most trustworthy dogs I've known in terms of her temperament toward dogs and people. She's never met a dog or a person she didn't want to greet, interact with, and kiss. Just look at this dangerous dog in action with Dr. Perle, who came to give Fozzie and Lamar their annual shots. Or with my sister, who has Star over on weekends to play with Genghis. Star loves to chew on a hoof when she's at my sister's house, and after she'd chewed on all of Genghis' chew hooves I got her a bunch of her own. Now we all know its bad to bother a dog who's working on a high-value chew, and the thought of a child bothering a chewing dog is enough to send some parents into cardiac arrest. But Ursula loves to be close to Star. Because we've witnessed this scenario many times before, we pretty much knew how it would unfold. and that in response to being touched she would simply roll over, wag, and continue chewing. Now does that look like a dangerous dog to you? Of course kids should be supervised around any dog, and should learn how to interact with dogs in ways that don't unduly stress them out. 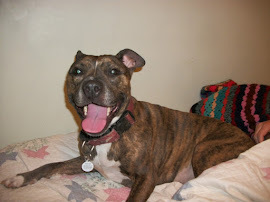 I am all in favor though of pit bulls getting back their reputation as "nanny dogs," because it is well-deserved. What a great post. I wish everyone who had a phobia to pit bulls could read this. Yes, kids need to always be supervised I wish more people realized that. 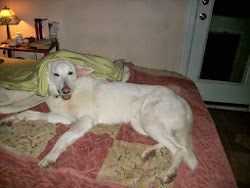 I love those pictures of Star, she is a Star and reminds me of Delilah, because when you come near her when she has a bone, she wags her tail. :-) Way to go little Star, let's shine the light on what your breed is really about!! It can be "dangerous" to make positive blanket statements just as it is to make negative ones and this is a real issue with adovacates of "pitt type" dogs. Advocates tend to be over defensive of the breed and I believe this may hinder their well being in the long run. Best to just judge the specific dog before you and in a realistic way. Thanks for that reminder Marjorie. I have the same thought every time someone's "sweet" bichon lunges for my throat while I'm trying to groom her :) It really is about the individual. If "pitts" had long fur and needed regular grooming it would be interesting to see what groomers experiences would be with them. No dog lunging at ones face is acceptable, but if I had to choose, I'd rather the bichon than the pitt. What concerns many about pitts is not just the fact that they may snap/bite, as given the right set of circumstances (for that particular dog), EVERY dog will bite, but it's the amount of damage a pitt has the potiental of doing due to their strength, size and determination. Every dog needs a responsible and realistic owner, but especially, large, powerful, high energy breeds. Yes indeed, pitties are large and powerful. That's why it is such a good thing that their bite inhibition and other indications of sound temperament consistently test higher than many other popular breeds. I do agree that many pitties have high energy and many are strong and large, but again this is true of many breeds. 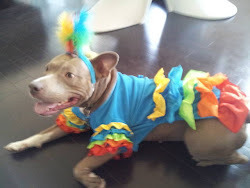 Pit bull advocates may sometimes make overbroad simplifications about the breed and gloss over some realities like their typically high energy levels, but they do so because the stereotypes against them are so ubiquitous and so in need of countering. The reality of pit bulls dying by the millions in shelters, and being separated from their loving families and euthanized because of their breed in places where they are banned, is so horrifying that their advocates feel called to work against it in any way possible. My boy dog has a big, strong jaw. He would also never bite anyone! He has had many, painful injuries in the 6 years he has been with me and at one point endured hours on a cold, hard lino floor at the emergency vet with a gaping puncture wound in his chest and vet nurses poking him every half an hour to make sure he was still stable, he was such a good boy though clearly exhausted and in pain. Regardless of his temprement we have come across several new vets who have been afraid of him because of what he looks like. Vets should know the doggie stereotypes aren't true but they are just so powerful that even professionals who deal with dogs of all shapes and sizes daily still buy into them! Yep! Another vishous pit bull type! Good on Star for coming so far and showing everyone what a good doggy she is. I read your comment on sweet bichons. I've been around dogs all my 50+ years, mostly big ones, and have only been bitten without provocation twice. Once by a daschund and once by a small mutt. As both you and the lady you were responding to mentioned, it does depend on the dog. 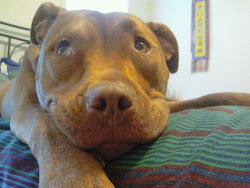 A blanket fear and hatred of pitties, canaries, filas and other "dangerous" breeds is simply illogical. Star seems so happy. Shelters do their best, but it is such an unnatural and horrible environment for most dogs, how can people see their true potential? My dogs also prefer it when I or someone else is sitting with them and petting them while they chew their bones. That is so very cute :) hopefully she finds a family with some kiddies to cuddle with! Star is adorable with her young fan! I hope that she finds a family where she can have a boy or girl of her own! Fabulous pictures! 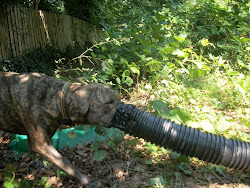 I love seeing how great Star is doing, in a foster home where she has a chance to be the wonderful dog she truly is. She's such a cool dog that this post made me cry! She had so much potential and you've made her blossom. I can tell you I bet 80% of shelters would have put her down, even some of those labeled "no-kill." You're right, each dog should have that chance to be loved and in an environment where someone with knowledge attempts to understand them and offer guidance.